USA President explained all about the lipstick on his polo's collar. He jokingly said that don't get any ideas about the lipstick on his polo, as reported by Political Ticker news on Tuesday. 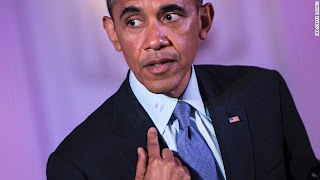 Obama said, "a sign of that warmth is the lipstick on my collar." he added, "I have to say I think I know the culprit." According to him, the aunt of American Idol runner-up Jessica Sanchez who did the kiss mark on his collar. He said, "I just want everybody to witness. I do not want to be in trouble with Michelle. That's why I am calling you out right in front of everybody." If you feel that this details are informative, please bookmark it now or visit this site more often for you to be updated. For the meantime you may share this post to your friends so they may know about Obama lipstick on collar. Thank You and God Bless!! Comments or suggestions about "Obama lipstick on his polo's collar" is important to us, you may share it by using the comment box below.